A still from the The Long Now Foundation video of the 10,000 Year Clock installation in a mountain. Seattle has several ties to the 10,000 Year Clock, a 500-foot-tall mechanical time keeper being constructed inside a mountain in the Sierra Diablo range in West Texas. Watch the the mesmerizing time-lapse video. Construction of the 10,000 Year Clock is ticking along. 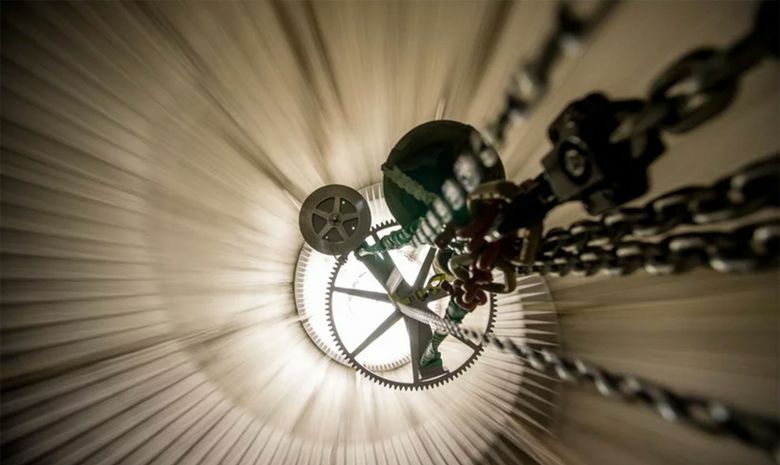 The 500-foot-tall clock, buried inside a mountain in the Sierra Diablo range in West Texas, has several Seattle ties. Amazon.com founder Jeff Bezos, who tweeted a video of the work, started backing the project in 2011 with $40 million. He has said he hopes the clock serves as an icon for fostering long-term thinking, and his team has launched the website 10000yearclock.net. Other Seattle ties include Seattle Solstice and Machinists Inc., both worked on the critical stone cutting that included designing cutting equipment and carving a huge spiral staircase into the mountain. Machinists Inc., metal fabrication specialists, also worked on parts for the clock. Seattle science-fiction author Neal Stephenson also reportedly contributed ideas for the Long Now Foundation which is building the clock. Clock of the Long Now – Installation Begins from The Long Now Foundation on Vimeo. The mechanical 10,000 Year Clock, the dream of inventor-engineer Danny Hills and cultural pioneer Stewart Brand of the nonprofit Long Now Foundation, will be powered by day and night thermal cycles with a solar synchronizer and clock winder. The clock is designed to measure time in years and centuries instead of seconds and minutes. It will tick once a year. Every time it chimes, it will be a different melody. Also carved into the mountain are five anniversary chambers, marking one year, 10 years, 100 years, 1,000 years and 10,000 years. The one-year chamber includes an orrery of the planets and interplanetary probes launched during the 20th century. In a blog post, Bezos suggests ideas for the 10-year anniversary chamber be emailed to 10-year-chamber@10000yearclock.net. On Tuesday, Bezos shared a video of the installation on Twitter. It has been retweeted more than 3,000 times. For those wanting to visit the clock (which won’t be completed for many years), it’s going to take some planning and stamina. The nearest airport is several hours away by car, and the rugged walking trail rises almost 2,000 feet about the valley floor. Bezos suggests potential visitors subscribe to Clock Interest by emailing a blank message to clockinterest@10000yearclock.net.